Welcome to Squamater Safaris a Botswana registered company operating as a Tour Operator business under Botswana Tourism Licensing Board. 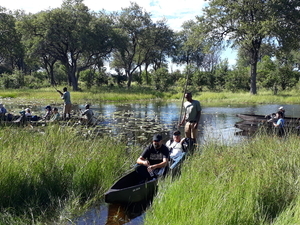 Our main office is based in Maun, the gate way to the famous World heritage site-the Okavango Delta. We offer activities such as; Game drives, Boat cruise, Mokoro excursions, scenic flights, Nature walk, Cultural Tours, and Safari camping. We also arrange tailor made safari destination safaris according to client's camp to the rich wildlife reserve-Moremi Game Reserve Park. Our aim is to offer you an unforgettable wildlife experience of a lifetime throughout your stay with us in the most convenient and comfortable manner. Squamater is a 100% citizen owned company run and operated by Paul Mothatlhobi a born and bred Khwai village resident. Paul has worked and experienced many facets of the safari industry. He worked in all aspects of lodge operations from the position of scullery, waiter, manager, mokoro poler guide and later as a Safari Professional Guide, he together with the team are fully knowledgeable to make your stay or travel adventure memorable. We are pleased to express to you confidently that your visit with us change lives in our community as we are empowering the Youth through employment, trainings, and attachment to gain more knowledge with our Mobile safari tour operator. We remain confident and assure you that with us on a safari trip we will create an enjoyable, memorable safari that stands the taste of time. Book with us and enjoy the best of Botswana. Had a quiet incredible experience that will forever be memorable to me.Thanks a lot Squamater Safaris.